Now that our ex-daughter-in-law has a new job, she’s asked my wife to watch our granddaughter Monday, Tuesday, and Wednesday when our son doesn’t have the kids. Our nine-year-old grandson is in school and takes the bus back to his Mom’s afterward, hanging out with his other Grandpa (the man has a number of disabilities, and while my grandson would not be challenging for him for a few hours, spending all day with an active, curious three-year-old certainly would). Our backyard faces the parking lot of an elementary school, and every Wednesday afternoon, the local library bookmobile is parked pretty much at our back fence. Our granddaughter loves books, so she’ll take the little one back there to look around for something interesting to read. Last Wednesday, I got home from work just as my wife was trying to get our granddaughter up from her afternoon nap. Sometimes, she’s a real “sleepyhead” and is difficult to rouse. That’s what was happening when I walked in from the garage, but the instant my granddaughter heard my voice, she cried “Grandpa’s home!” and rocketed out of our spare bedroom and down the hallway toward me. I picked her up and she rested her head against my shoulder for several seconds. Then she got all excited about going to get more books, so my wife and I walked her down the little path between two neighbors’ homes to the school. I don’t recall if it was the same day or a different one, but she wanted to play “Come find me,” which is a much less sophisticated version of “Hide and Go Seek.” She likes to hide behind my wife’s clothes in our walk-in closet, and even though I know exactly where she is, she still says “Come find me, Grandpa,” over and over again. That’s what’s important. She’s what’s important. She’s not the only thing important to me. Her brother’s important, too. So is the rest of my family. But my granddaughter is at an age where everything is still brand new, and a leaf on the ground or the bushes in our backyard are terrifically fascinating. She loves picking basil off of the plants we’re growing and eating them. It’s amazing to watch how her mind operates as she explores her environment. I mentioned in this blog post that I believe there’s a difference in how our grandchildren react to us based on gender. I’m sure a lot of people will disagree with me, saying that gender isn’t binary and that there are no appreciable differences between men and women except as assigned by culture. That’s fine. I’m discussing my own experience and who is a better expert on such a topic than me? Sure, there’s some overlap. Our granddaughter can choose to come to either my wife and me to be comforted when she’s hurt or scared, but it’s possible that she feels more “nurtured” by my wife and more “protected” by me. I can’t prove it, but it makes a sort of sense. My granddaughter has inherited the little playhouse we originally got for her brother when he was much younger, and my wife got her little tea sets and tiny plates and utensils. Those, she’ll use to make me “coffee,” and when it’s warm, we’ll give her some water so she can “cook,” and then we’ll “eat” together. I know I’m probably rambling now, but the world is never quite so clear to me as when she’s with me. Nothing else really seems to matter. She is real life. A lot of the self-important opinions on the web, not so much (yes, the people behind them are real, but there’s something about virtual communication and inhibits their – and my – reality in terms of interactions). I worry about my grandchildren. The world’s quite a bit more messed up than when I was a kid. I was my granddaughter’s age in 1957 and my grandson’s age in 1963. As you can imagine, things are really different now, and not in too many good ways. By the time they grow up, what will the world be like for them? Will there even be a livable world by the time they get to my age? I don’t have the answers to those questions, so I think I’ll just concentrate on trying to be the best Grandpa I can be to them in the here and now. And now for something completely different. 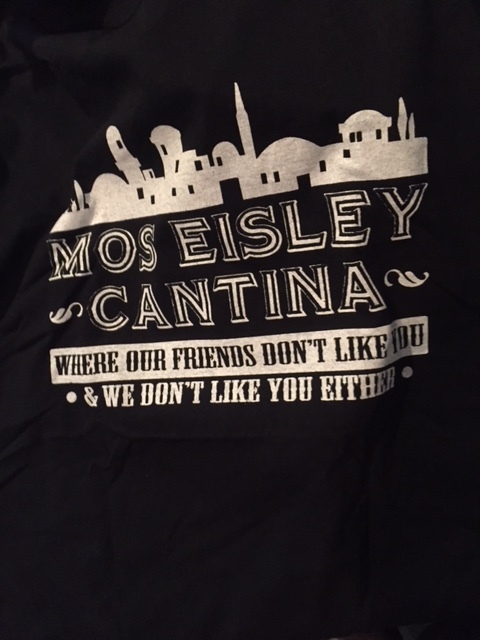 This $5.00 t-shirt just arrived in the mail. Pretty cool, huh? I was going to write this anyway, but I try not to waste a good writing prompt, so I accepted the Saturday Mix – Opposing Forces challenge hosted at Mindlovemisery’s Menagerie. The idea today is to take two sets of words, the words in each pair being the antithesis of the other, and to use them in a poem, short story, or other creative work. Those words are bolded above. Mainly though, I just wanted to combat the general panic attacks on the internet over various politicians and social justice causes and say that while those topics can be important, they’ll never be more important to me than my grandchildren. If you don’t have those sorts of connections in your life, you’re missing out. 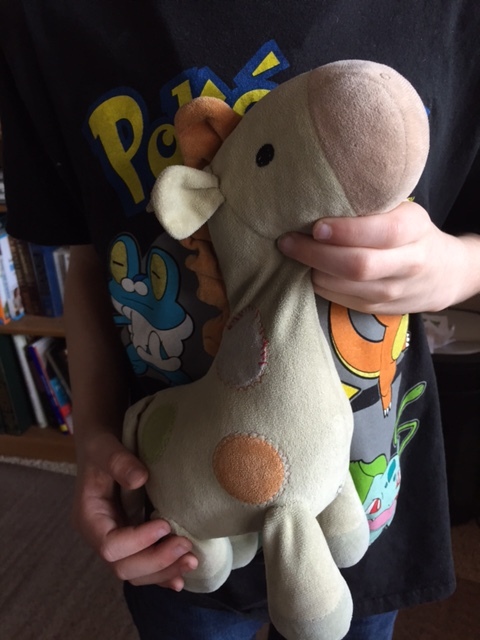 Oh, I promised my son I wouldn’t put any photos of his children online that showed their faces, so I posted one of my grandson holding up a stuffed animal. Lovely post James. We were talking to a proud Grampy today at the carnival. His grandaughter is 4 months old and grandson 16 months. Lovely kids, the baby happy and smiling. Grandkids always make life better.